Mall of Asia Arena, Pasay City – A multitude of brethren and guests were emotionally moved when Bro. Eli Soriano said that ‘the greatest story of love ever told, is the love of God to humanity’ during the Special Worldwide Bible Exposition early in December. “The Bible is a love letter from God,” Bro. Eli explained further to the thousands of people who joined the program’s milestone. Positive astonishment was mutually sensed from the crowd. Some brothers and sisters were even brought into tears of joys while singing songs of praise and upon realizing the deep meaning behind the tremendous love of God to mankind. The Overall Servant to the Members Church of God International (MCGI) is the host of the religious program Ang Dating Daan, which celebrated its 36th anniversary on December 9, 2016 at the Mall of Asia Arena in Metro Manila, Philippines. 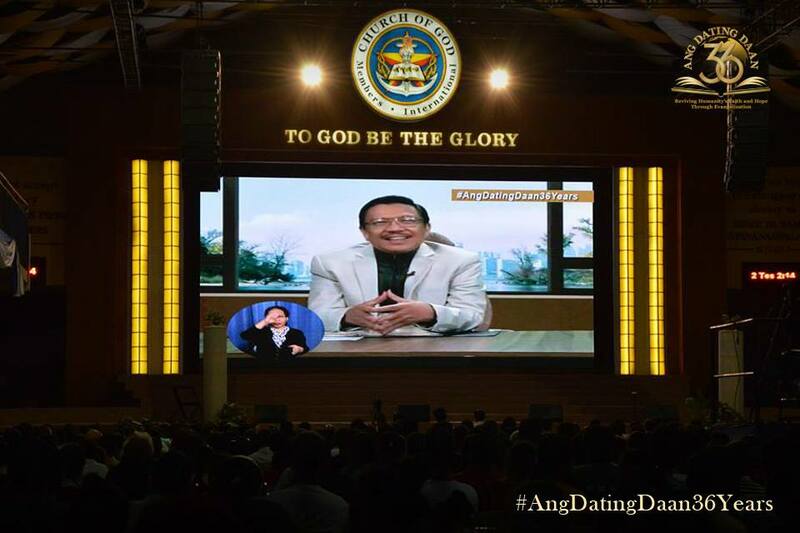 Tracing its first radio airing in 1980 and its premiere broadcast on television in 1983, Ang Dating Daan is now regarded the longest-running Philippine-produced religious program in the country. Bro. Eli and Kuya Daniel Razon has been hosting Ang Dating Daan for the last 36 years. Bro. Daniel, who was first to speak during the evening’s celebration, expressed his gratitude to God and welcomed everyone who attended the Special Worldwide Bible Exposition. “We are first thanking the Lord that we have reached the 36th year on air [of Ang Dating Daan]. Thanks be to God for bestowing upon us colleagues in promoting the broadcast of the program Ang Dating Daan― our partners from the Members Church of God International and to all of the people who have extended us their courtesy at numerous venues where our Bible Expositions are being held such as in various provinces here in the Philippines and also in different parts of the world,” said Kuya Daniel on stage. Over 15,000 people flocked towards the Mall of Asia Arena in Pasay City and thousands more linked via coordinating centers and satellite receiver centers all over the world during the celebration. Bro. Daniel told guests of the Worldwide Bible Exposition that the celebration hooks up different remote points in the multitude of regions across the world, including South America, North America, Europe, Asia-Oceania and some parts of the Middle East. Furthermore, Bro. Daniel told supporters that this momentous gathering can also be witnessed through official Church websites, official Facebook pages and Youtube channels. “We are happy to be with you in this moment in our quest for the truth. Our invitation to you comprises of us learning together, thinking about and reflecting on the words of God,” said Bro. Eli live via video streaming. “We are thanking especially our followers on Facebook, Youtube and from various social media platforms. We are hoping that you could join us in this moment of us learning the words of God,” uttered Bro. Eli as he encouraged netizens to tune in to the biblical symposium. The Members Church of God International Music Ministry called for everyone through songs and dances of praise to be in one with the Ang Dating Daan 36th Anniversary Celebration held last December 9, 2016 at the Mall of Asia Arena. The Ang Dating Daan 36th Anniversary Celebration immensely moved netizens as #AngDatingDaan36Years climbed the top spot of the Philippine trending list at 6:26 p.m. of December 9, 2016. The hashtag trended for 14 straight hours. There was an enormous amount of support from brethren and friends for the Ang Dating Daan 36th Anniversary Celebration as seen in fan sign photos. The MCGI has such a huge patronship online that it has recently gotten 80,000 followers and counting on its official Facebook page along with several websites under its administration. 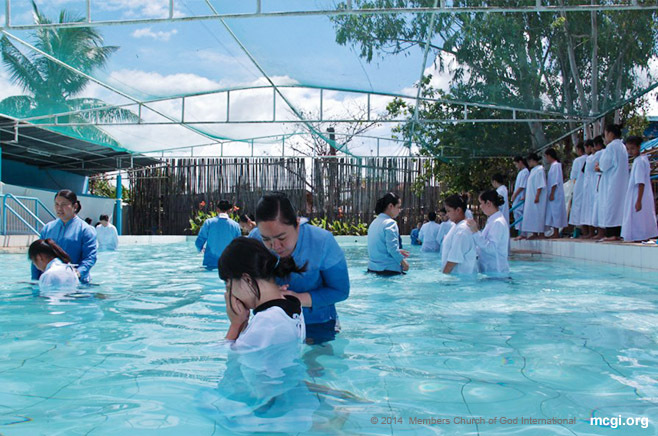 Read short testimonials of faith from some of MCGI’s youngest brethren baptized on January 15, 2016 at the Ang Dating Daan Convention Center in Apalit, Pampanga. Bro. Eli explains well. When he explains, you will really understand why, how and what is prohibited. That is what I liked about him. I felt happy when I was baptized earlier. I was really very happy. I was working in Makati in 1998, then an elderly person approached me. He told me to listen, and he would always invited me to attend church services. Then when I transferred to Bataan in 2004 or 2007, I listened to him. And now the person who has been my guide in joining this Church is my wife. I have been actually indoctrinated in 2008 for about three times, but I wasn’t able to continue with baptism because my children were still small then. They ran and ran around the house, but now that they’re in college I decided to listen again. When I was studying in high school from 1989 to 1991 I’ve already been seeing Bro. Eli on TV. Actually, my relatives are Born Again members, and whenever I tuned in to Bro. Eli, they would tell me not to listen to him; they even called it a cult. But I said he’s really good with the Bible, and I was really amazed. Only, I was still a teenager then, and I also didn’t have any interest in religion. I only developed that when I already had four children. I hope that they will be able to encourage many more people like me who are thirsty for the word of God. I am really amazed and inspired by Bro. Eli because he helps even non-brethren. That is the point where I got really amazed by him. The Church of God International is really exceptional. Actually, out of all the religions that I have listened to and been to, this is the one that I believe in because this is based in the Bible. We [my mother and I] have actually been watching Bro. Eli on TV and that’s where we first saw him. I was still in college maybe about 2002 then when I started listening, but it wasn’t continuous. We just watched him like so and so. Also, the locale was a bit far from where we lived back then. In 2012, we moved here to Pampanga as we were from La Union. That’s the time when my mother listened continually to Bro. Eli. Then, we planned to attend the indoctrination sessions, but it didn’t materialize. Then I went abroad. My mother however kept on listening, but didn’t get baptized. In 2012 she passed away. 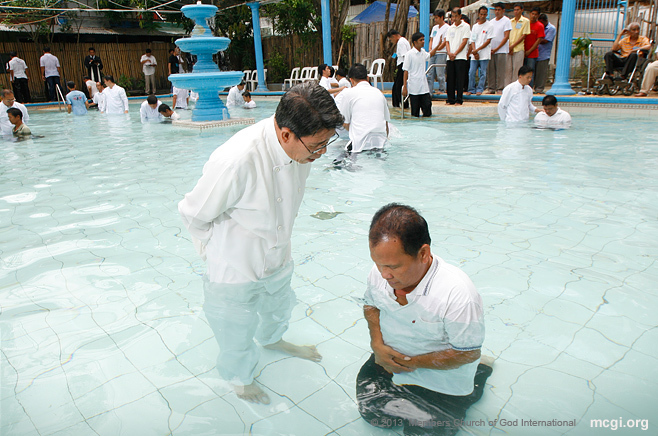 So I said to myself, the first thing I’m going to do when I returned here in the Philippines is to get baptized. 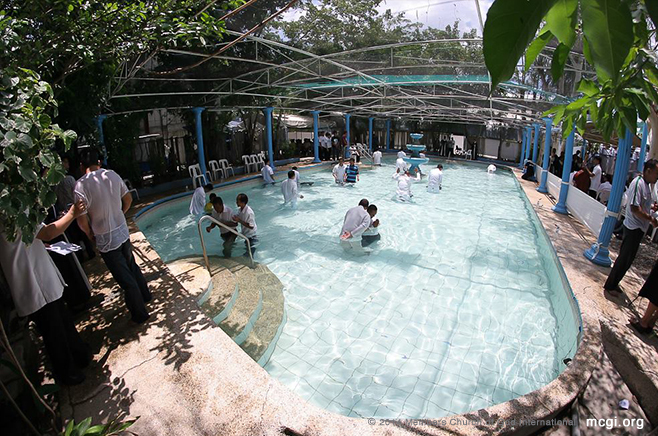 When I came here in July, I sought a locale that was near our place, and got indoctrinated and baptized. I felt renewed. Actually even as I was just entering the baptistery, and even just during the singing of hymns, I couldn’t stop from crying already. I could just feel that there was something different about it, and especially when I got baptized already. Bro. Eli and Bro. Daniel many, many thanks to them because they have been the instruments for me to be able to return unto God. Firstly, the reason why I wanted to join the Church is because I see many learnings in this Church. It’s unlike in other religions wherein, despite the teachings are written in the Bible, they don’t teach all of them. Above all, I have seen many doctrines here that have truly enlightened me. I started listening through UNTV Radio. Before I joined, I listened on radio as they also air Bible Expositions there. I heard the questions of the events’ guests and also those who wish to join the Church. I just started listening in August 2015. I felt something changed in my being after I got baptized. My mind has been enlightened, and I feel that I want to obey all the commandments of God. I actually got hit by a motorcycle before baptism. But instead of being angry at the driver and filing a complaint, I just advised him to take care the next time. I wanted to get to the locale as soon as possible because I didn’t want to be late for my baptism and not get baptized. First of all, I am thankful to the Church as I saw that there are truly many good teachings and things that members here can learn. I became a member of the Church of God because of my wife who is a member as well. She’s about 12 years in the Church already. I’ve been listening for a decade already actually. However, from 2014 to 2015, I’ve continually been attending all the Church services: Thanksgivings, worship services, prayer meetings. Sometimes though I wasn’t able to attend because there were conflicts at work. I just really felt that I was being called. For Bro. Eli and Bro. Daniel, I thank them because of their desire to preach the true Gospel. Many, many thanks unto God.